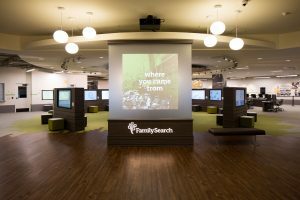 If you are just beginning to explore your genealogy, you’ll want to start at the FamilySearch Center, east of Temple Square. The FamilySearch Center occupies part of the main floor in the Joseph Smith Memorial Building (formerly Hotel Utah). The center has individual computer stations with access to family history resources. Staff is available to help you free of charge.